The service quietly launched on Thursday, Oct. 11, with an evening program hosted by Simone Boyce. Back in March, NBC News chairman Andy Lack told reporters that his company was “exploring a separate linear stream for NBC News.” Now he’s found one, as the company has unveiled its new streaming news network, NBC News Signal. The ad-supported streaming service quietly launched on Thursday, Oct. 11, with an evening program hosted by Simone Boyce. The program will air each Thursday for now, but will become a nightly show later this year. Boyce’s program, which doesn’t yet have a name, is one of three daily shows that will appear, eventually, on Signal. NBC News said a morning and afternoon show will be coming down the line, but those programs’ titles, hosts and launch days are currently TBD. NBC News Signal programming will significantly ramp up by the end of this year, and the company said it will evolve into a full 24/7 streaming news network by mid-2019. Simone Boyce is hosting a still-unnamed program on Thursday nights. The company has been testing programming on the network with more than 20 shows, including Steve Kornacki’s Way Too Early, and 218: The Race for the House series, which will now air daily at noon ET through the midterms. Katy Tur will host a special show for the service on election night (Tuesday, Nov. 6) that will air from 7-9 p.m.
NBC News presently has 10 full-time staffers working on NBC News Signal, including executive producers Erica Fink and Christine Cataldi. The service will draw on NBC News’ vast resources for content, staffing and technology. Signal is currently available on NBCNews.com, NBC News’ OTT and mobile apps, PlutoTV, YouTube and Twitter. 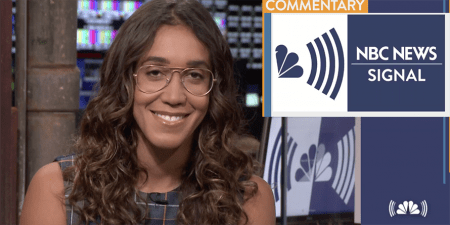 NBC News Signal will be the third streaming news network from a major news organization that will be up and running by year’s end. CBS News’ CBSN was first on the scene in 2014, and has been working this fall to increase brand awareness by wrapping the New York shuttle train between Grand Central Station and Times Square in blue and red. Even as the streaming news space gets more crowded, NBC News execs believe there will be a place for Signal. “Our research has shown us that they are hungry for news around the topics of the moment but they’re not likely to subscribe to cable or not feel fulfilled by the quick bites from mobile news notifications. That’s where we come in,” said Ascheim.